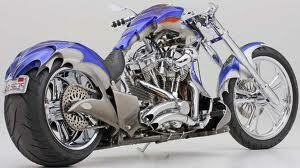 Do you own a tricked out bike that you would like to take to the next level with a custom designed paint scheme? We can help ! ... We do all kinds of custom paint designs in all kinds of colors, custom paint effects like Pearls, Candy Colors, Flip flop, Metal flake, Marblized, Wood Grain, or just about anything you can think up. We also can do custom designed airbrush work, gold leaf and pinstriping ... Just give us a call and set up an appointment and we can discuss what your vision is that you would like to create and we will make it happen! Did another driver fail to "look both ways" and damage your prized possession? We can help !! ... We can work with your insurance company or a third party insurance company or individuals to get your bike repaired as good as new with a guaranteed color match and make your bike look as good as new again just like nothing ever happened to it. Heading out with the "guys" and want a new look before your next ride? We can help!!! ... We can do accessory installation to your bike and paint it to match your existing color or change it around a bit and add a second color or pinstripe it or airbrush graphics on it, whatever it is that you have in mind we can tackle that project and have you sitting tall in the seat while your sporting that brand new look that has the other riding buddies jealous ! Got the "new bike itch"? 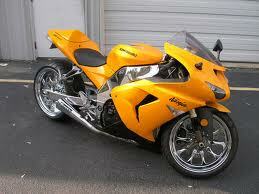 We can make it look like a completely different bike without breaking the bank!!! Yes, We can help!!! ... We specialize in first class finishes and custom designed paint and graphics ... we can work with you to build that one of a kind motorcycle that stands out from the crowd. 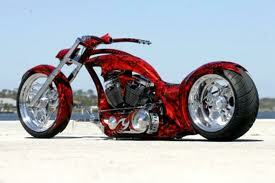 we can work from yuour design or can do a rendering of some ideas for paint jobs that will have you loving the look of that bike again just like the day you took it home. Give us a call and lets discuss what you have in mind for your ride and we can work with any budget you have in mind. Give us a call today !